I have eaten a lot of different quesadillas and I listed the favorite fillings in this blog post about the basic quesadilla recipe. 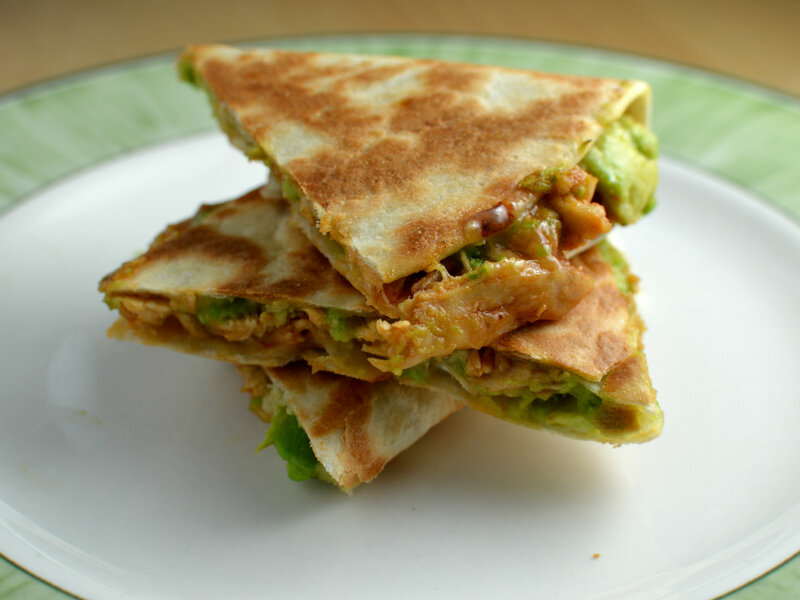 A new filling is now added on the list and it deserved a recipe on its own, avocado quesadilla with shredded chicken and bbq sauce. Shredded chicken is awesome to have ready in your freezer. To prepare it just cook chicken in broth until it is cooked through. Set aside the broth and start shredding the chicken with 2 forks. Freeze in ziploc bags. I don’t know how many times I have bought avocados that were just a little too hard, forgotten a few days and suddenly they are brown.. The best trick if you have bought unripe avocados is to leave them on the counter until they are just the right consistency, the ones you don’t eat right away should then be placed in the fridge where they will last a lot longer than on the counter. Barbecue sauce is always standing in my fridge door and together with tortilla bread and some shredded cheese you have an awesome meal! Cut the avocado in half, remove the pit, cut out small pieces but don't mash it completely, set aside. Add one tortilla then spread shredded cheese on it, then add the filling on half the tortilla.